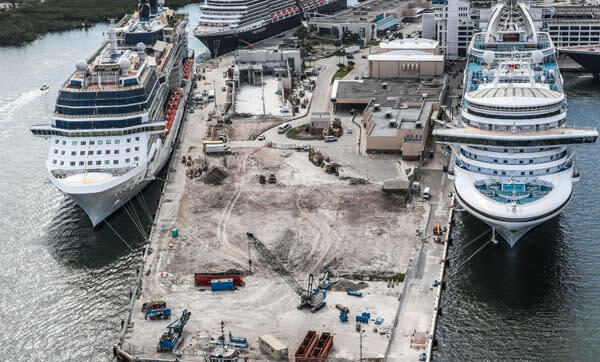 Demolition, renovation, and expansion of Cruise Terminals 22/24 and 25 to turn them into one large terminal known as Cruise Passenger Terminal 25, is underway. The Terminal 25 facility will be comprised of a new and improved U.S. Customs and Border Protection area, ground transportation layout, baggage collection areas, baggage processing area, new check-in counters, new seating, easier passenger movement within the terminal, and new passenger loading bridges. Current Status: After a competitive selection process during the summer of 2017, Royal Caribbean Cruise Lines selected Moss and Associates as Managing General Contractor for the project. Design of the new terminal is completed, city permitting underway and construction began November 2017 and is progressing on schedule. Terminal 25 construction as of January 2018. 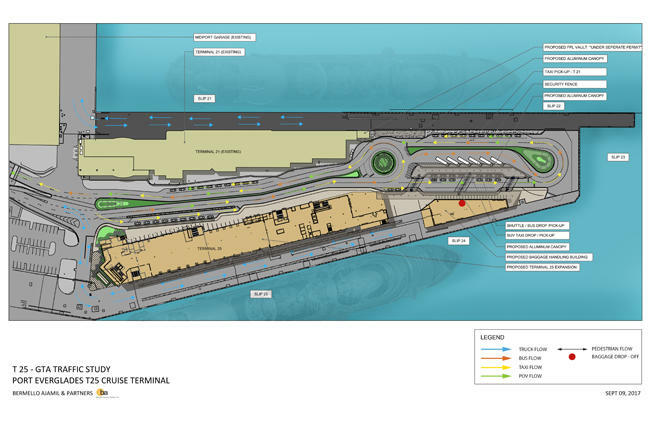 Example of Cruiser Terminal 25 renovation plans and general transportation area.